I'm trying to read Multi-messenger Observations of a Binary Neutron Star Merger the "cast of thousands" OPEN Access ApJ letter 848:L12 (59pp), 2017 October 20 https://doi.org/10.3847/2041-8213/aa91c9 and get a feeling for the sequence of events that took place as the gravitational waves and gamma ray burst reached Earth at about 12:41 UTC 2017-Aug-17. There seems to be five instruments involved in the first detection and direction determination; LIGO-Hanford and LIGO-Livingston, VIRGO, Fermi-GBM, and INTEGRAL. The first three are gravitational wave detectors and the last two are gamma-ray telescopes in Earth orbit. Figure 2 of the paper (part of which is shown below) provides a densely packed infographic of the early observations. In the top left one can see an inset that spans from twelve seconds before the merger during the gravitational wave (GW) ramp in frequency, to six seconds after, where the majority of the gamma ray burst (GRB) is detected. Somehow the combination of the GW and GRB set in motion a sequence of events that triggered a world-wide observation campaign to look for the event in all the remaining electromagnetic spectrum from radio through visible and UV to X-rays. Neutrino data streams were checked as well. Question: I'd like to ask about the sequence of events, the alerts, and the rapid automatic and manual analysis of the GW and GRB data which triggered the alerts. Which detector or combination first "saw" the event as some kind of flagged event? Did one trigger a rapid analysis of the other? Were these automated alerts triggering software to re-analyze, or SMS text messages to thousands of cell phones triggering everyone to sit down at their work stations? below: Figure 2 (partial) showing the timeline seconds before and hours and days after (logarithmic scale). The GW and GRB data were used (see Figure 1) to start the search for the rest of the electromagnetic search. below: Figure 1 showing the localizations made from different sets of GW and GRB detectors. 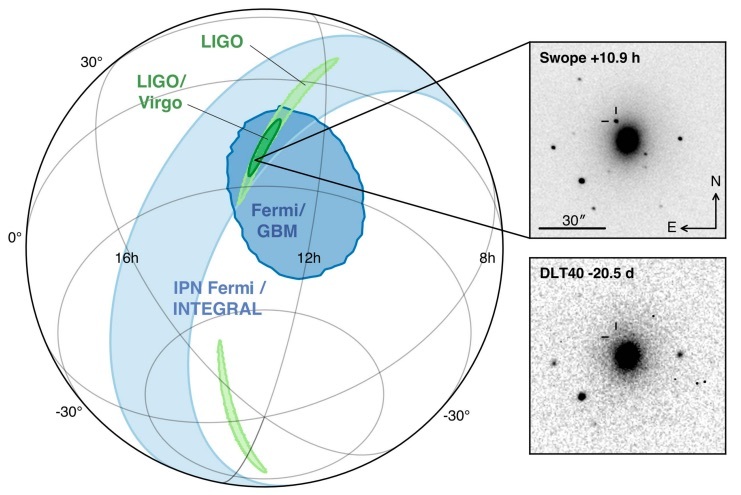 The initial Fermi trigger can be found here, and the following sequence of alerts that were sent out by the LIGO Scientific Collaboration/Virgo Collaboration (LVC) and various electromagnetic observers following-up the event can be found in the GCN circular archive here. This doesn't quite give the whole story of the time line of events, but is a good start and the linked "Multimessenger" paper is fairly comprehensive in giving the complete story. As shown in the figure, the signal arrived first in the gravitational wave detectors, with gamma-rays arriving at Fermi and INTEGRAL approximately 1.7 seconds after the observed merger time. However, the online analysis software on-board Fermi was quickest off the mark in detecting the burst and generating an automated trigger just 14 seconds after the signal arrived (I don't know any more of the internal details of Fermi triggering, how the alerts get sent out to people, or what subsequent manual interventions are required). 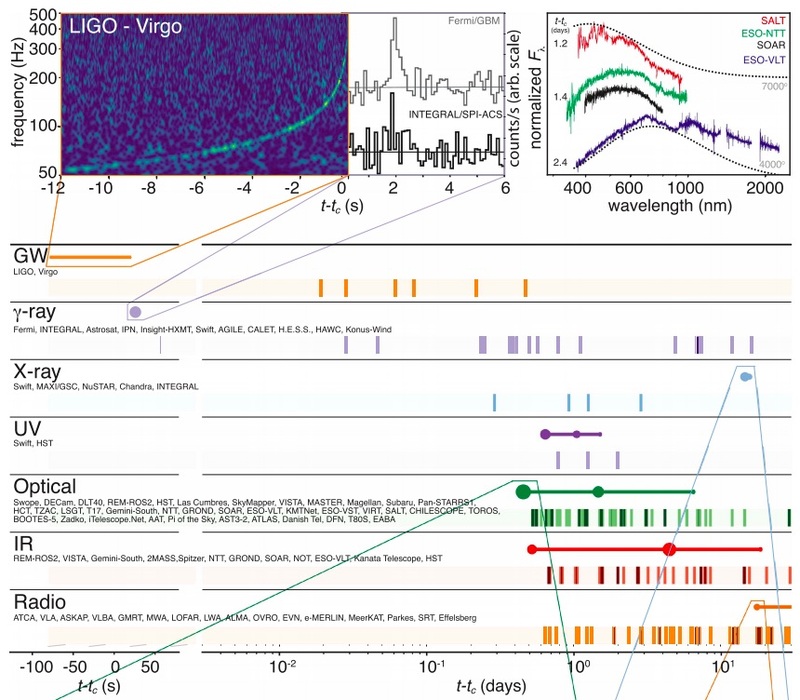 Within a little over 7 minutes the online automated software searching for gravitational wave signals using compact binary coalescence templates (see, this paper and this paper) had produced a candidate using data from the LIGO Hanford detector alone (LIGO Livingston data had been automatically vetoed by the software due to the presence of a glitch [Figure 2 of this paper], and Virgo data hadn't yet propagated to the location where the analysis was run) - this automatically notified (via email or text) a number people in the LVC that something interesting had happened. Less than 10 seconds after the gravitational wave candidate had been recorded, an automated code called RAVEN (see, e.g., Section 4.1 of this paper) noted the temporal coincidence between the Fermi trigger and the gravitational wave candidate. After being notified of the gravitational wave trigger, various people within the LVC initiated a conference call and started manually looking at the data and saw the obvious chirp-like signal in time-frequency representations of the data. Roughly 33 minutes after the gravitational wave trigger, and 40 minutes after signal arrival, it was decided (people were involved) to issue an announcement (the first entry in the GCN list here) that there was a joint Fermi gamma-ray burst trigger and gravitational wave trigger. Regarding signal arrival times at the various gravitational wave detectors: it arrived first at Virgo, followed by the LIGO Livingston detector, and finally at the LIGO Hanford detector. Not the answer you're looking for? Browse other questions tagged gravitational-waves neutron-star gamma-ray-bursts or ask your own question. How many amateur telescopes are looking for serendipity in a coordinated fashion, on average? How can we know the nature of the companion in a neutron star binary? How do we know an event is a gamma-ray burst? What happens over time as a neutron star cools? What is the final destination of a neutron star?